In their ongoing effort to lead the field by providing the best diagnostic imaging capabilities for small animal patients, AVMI announces the installation of the first dedicated veterinary high field (1.5 Tesla) MRI in southern California. “Not all MRI scanners are created equally,” states Dr. Michael Broome, owner of AVMI. Most veterinary facilities rely on older, used equipment. AVMI has now installed a brand new GE 1.5 Tesla MRI scanner. This new, state-of-the-art, high field GE MRI scanner will ensure not only the best images available, but also the most efficient and rapid exam possible. AVMI also has heavily invested in the most sophisticated patient monitoring equipment available to minimize anesthetic related concerns. An MRI exam consists of multiple images (or slices) obtained using different patient orientations (or planes) and utilizing different protocols (or sequences) to demonstrate different aspects of patient anatomy and chemistry. Physicists are continually working to develop new MRI imaging sequences that allow the visualization of additional patient information during the MRI exam. “The addition of this new equipment will ensure that AVMI can perform all of the newest sequences available, ensuring the most accurate diagnosis,” says veterinary radiologist and world renown MRI expert Dr. Pat Gavin. “With this new machine AVMI provides the best MRI image quality I have seen to date.” Image quality in MRI is directly proportional to the strength of the magnet. 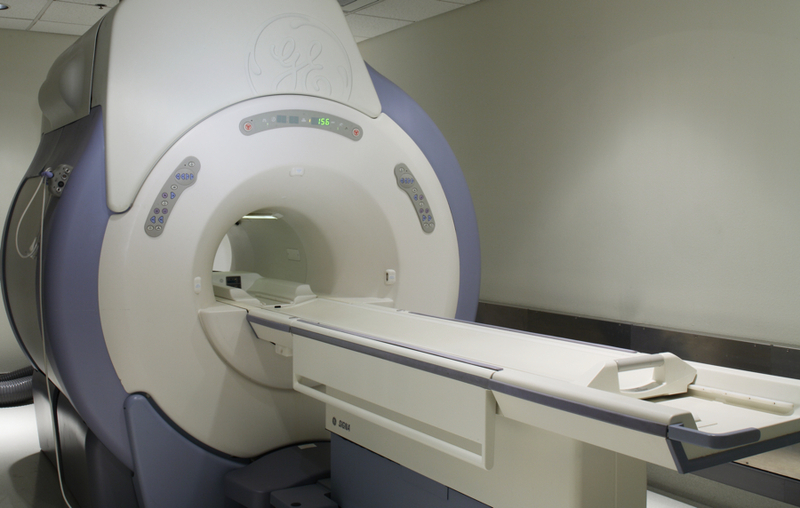 High field strength MRI scanners, like AVMI’s new GE 1.5 T magnet, allow imaging with smaller fields of view and slice thicknesses, ensuring an accurate diagnoses in every patient but especially in smaller patients including small puppies and kittens. The radio-frequency waves that are emitted from the patient and responsible for the MRI image are actually received by an antenna typically referred to as a coil. Coil design is a major factor in MRI imaging. The coils available with new high field MRIs allow the routine screening of the entire spine which can be critical prior to considering spinal surgery.